So, Christmas was a great success. I got lots of cool toys. I have been trying my hand at fashion designer with all of the costumes I received. You can view some of my cutting edge designs in the new photos I posted. We even had a visit from Santa. I was surprised how eerily similar Santa looks to my Uncle Jon. We had a Valentines Day party at school last week. Dad helped me make personalized valentines with a picture of my face on them to give out to my many, many friends. 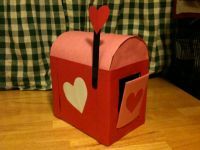 And of course I had the coolest valentines box in the class. The party was really fun, but I am not sure who was more excited about it, me or dad.